Look here for a general description of this robot and pictures of the fully-assembled model. Eight #16 beams. 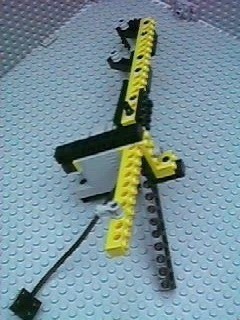 The yellow beams I used here come from the 8250 Search Sub kit. 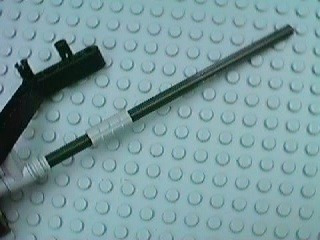 Now it's time to build the motor assembly. 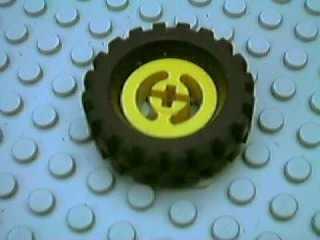 There are four pieces. 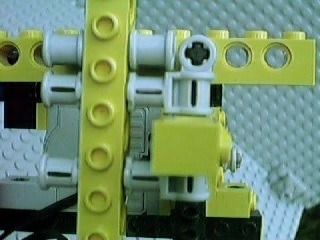 The first piece is the motor itself. 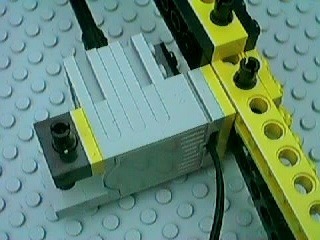 Attach a 9V connecting cable as shown (you want to use the ones that are about 20 cm long). 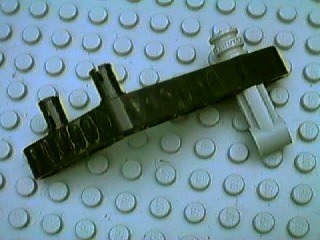 Also attach an axle extender to the motor's axle. 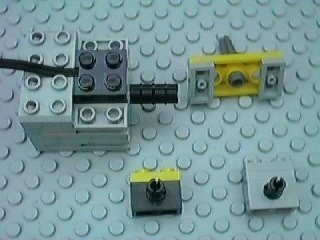 The second piece is made from a 2x4 Technic plate, a #3 cross axle with stud (the dark gray one) and two 1x2 plates. 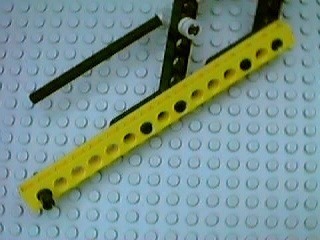 The third piece is a #2 beam with one 1x2 plate on top and a black friction connector peg. 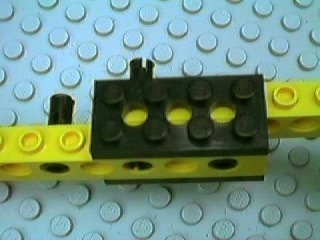 The fourth piece is a #2 beam with two 1x2 plates on top and a black friction connector peg. 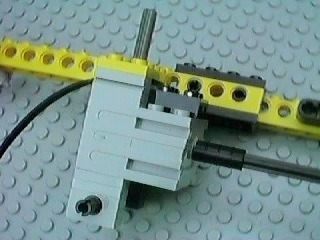 Completed motor assembly viewed from the "back"
Motor assembly attached to axle. 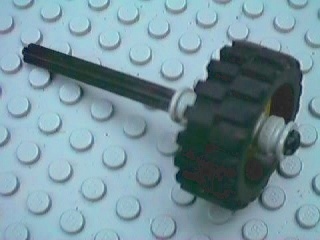 One side of the motor assembly. A #8 beam will go here. 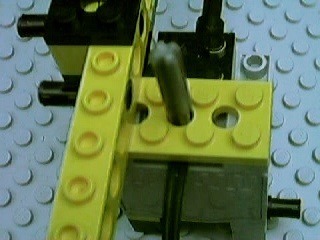 The other side of the motor assembly. A #10 beam will go here. Congratulations! 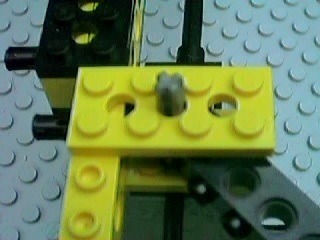 You've finished one third of the robot. Now you just have to do the same thing two more times. 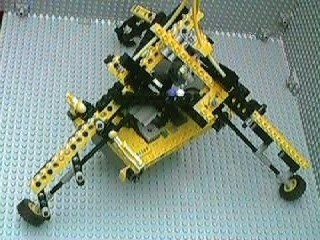 Now it's time to assemble the three legs into a robot. 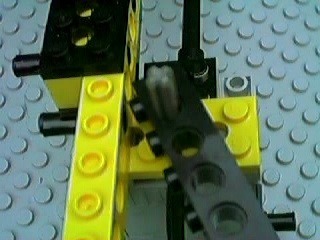 The end of the leg with the wheel is the bottom, and the other end is the top. Look at this picture carefully. 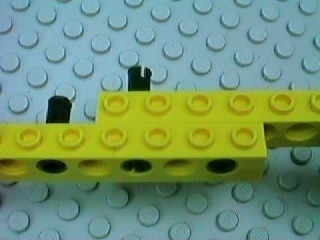 The three legs need to be aligned just as shown in the picture. 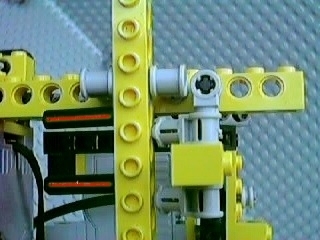 If they're aligned properly, each leg can be attached to the other two by adding two #3 cross axles as shown in the following pictures (you'll use six #3 cross axles and six bushings). 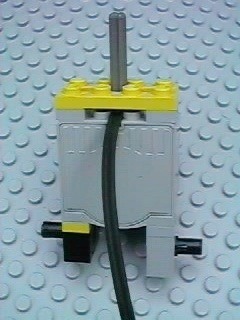 When you're doing this, you don't have to try to hold all three legs in place at once. 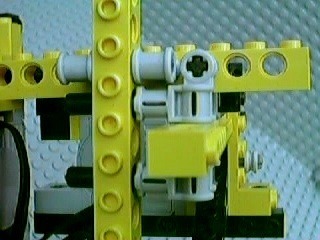 Just connect the first two, then add the third leg, then add the final pair of #3 cross axles. 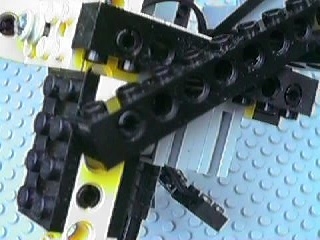 All four arms have to attach to a leg in the manner shown. 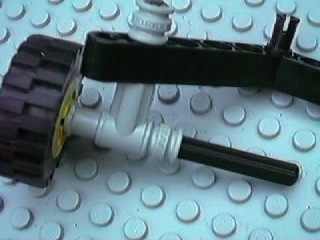 Since there are only three legs, two of the suspension arms share a leg. 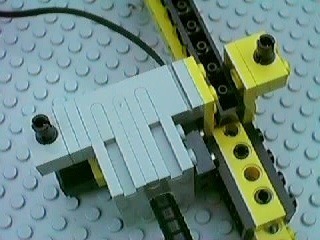 This is done by using a #4 cross axle so you can attach both suspension arms to either side of the leg. 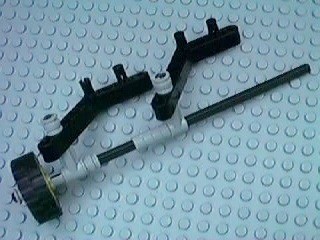 The leg with two suspension arms will become the "front" of the robot as shown in most of my pictures on the RILYBOT 2 page. The end that will go towards the "front" is the end in the lower-left corner. 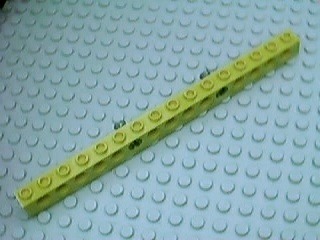 This end has five empty holes before the first 3/4 connector peg; the other end has only four. 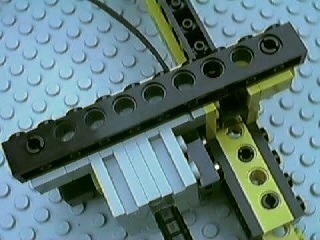 Connect the beams to the ends of the suspension arms. 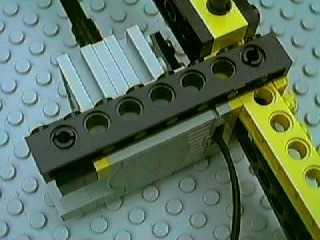 The beams should be parallel, and horizontal when the robot's three wheels are on the ground. 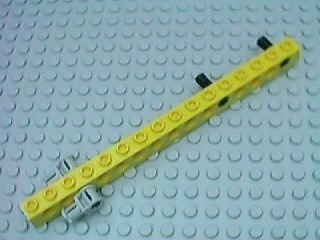 They should also be running "front-to-back", and the spacing between them should be about right for an RCX. 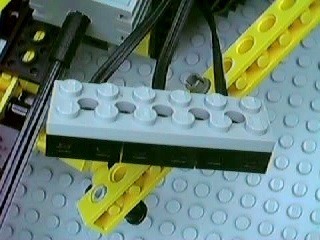 The 3/4 connector pegs should point "in". 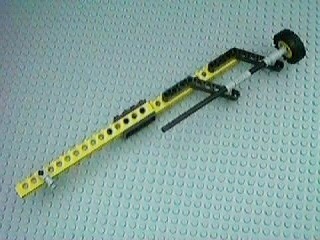 To get the beams to line up right you might have to change the suspension arms a bit  each suspension arm ends up being a little different. 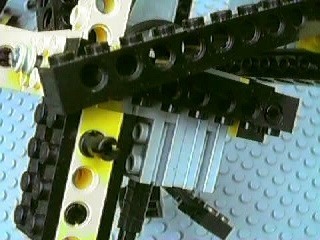 The ball-and-socket joints give you most of the flexibility you need to make it work. 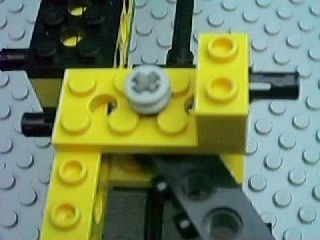 Finally, connect the RCX in between the two beams and attach the three motor connectors to the RCX. 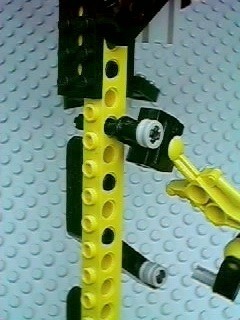 Two pictures of the minifig and antenna decorations are at the bottom of this page. This robot does not (currently) use any sensors. Its RCX program is designed to move in response to commands from the RCX infrared remote control.